처음 지어진 정확한 시기는 알 수 없으나, 우암 송시열의 8대손인 송병일이 대한제국 시기에 충청감사로 있을 때에 아버지를 위해 별당을 지어준 것이 증축을 거쳐 종택으로까지 사용되었으나, 현재는 충북양로원으로 사용되고 있다. 원래는 여러 채의 집이 있었다고 하나 지금은 안채, 사랑채, 곳간채, 사당, 대문채만이 남아 있다. 안채와 사랑채는 모두 앞이 트인 ‘ㄷ’자형으로 동·서로 나란히 서있고 그 사이에 낮은 담장을 가로질러 영역을 구분하였다. 안채 앞에는 ‘一’자형의 곳간채가 길게 가로막고 서있어 전체적으로 트인 'ㅁ'자형을 이루고 있다. 3칸 크기의 대문채를 지나 안으로 들어서면 사랑채가 대문채와 마주 보고 서있으며, 안채와 사랑채 사이의 담장에 난 협문을 통해야만 안채로 진입할 수 있다. 결국 남성들의 공간인 사랑영역을 지나지 않고는 여성들의 거주공간인 안영역으로의 접근은 불가능한 배치를 갖추었으며 이는 성리학적 질서에 충실한 조선시대 사대부 민가 공간구성 수법의 좋은 사례이다. 안채는 7칸 크기의 몸채 동·서 끝단에 3칸의 날개를 앞으로 붙여 ‘ㄷ’자형으로 만들었다. 안채의 가운데에 각 2칸의 큰방과 대청을 두고 큰방 서쪽에 안방과 부엌이 연이어 있으며, 대청의 동쪽에는 작은방을 붙였다. 서쪽 날개는 3칸의 크기의 부엌에 이어 앞으로 2칸의 온돌방을 두었고, 동쪽 날개는 작은방 앞의 툇마루를 사이에 두고 2칸의 방과 1칸의 방으로 구성하였다. 안방에서 작은방의 앞으로는 툇마루를 두어 동선을 연결하고 있다. 사랑채는 안채와 같은 ‘ㄷ’자형으로 안채보다 규모가 작다. 6칸의 크기의 몸채 앞으로 2칸의 날개를 내밀어 평면을 구성하였고, 몸채 가운데를 둘로 나누어 서쪽은 안사랑, 동쪽은 대청이 각 2칸으로 되어 있다. 안사랑의 연이은 서쪽의 뒷칸에는 골방, 앞칸에는 부엌을 두고 그 앞으로 2칸의 작은사랑방을 내밀어 서쪽 날개를 이루고 있다. 대청의 동쪽에 붙은 방은 윗사랑방 앞으로는 2칸의 마루방을 두고 앞칸은 한단 높여 누마루와 같이 만들었다. 사당은 대개 3칸이지만 이곳은 4칸으로 구성되어 있다. 앞쪽에는 툇마루가 있고 가운데는 대청으로 되어있어 사당으로서는 특수한 평면구성을 보이고 있다. 19세 후반의 건물로 안채는 사랑채보다 지어진 연대가 조금 앞서며, 사랑채는 건축기법이 뛰어난 건물이다. 전체적으로 떨어져 나간 부분과 고친 부분이 있어 그 규모를 정확히 알 수 없으나 조선 후기 사대부집으로서 우수한 가치가 있다. Built in the late 19th century, this large residence is currently being used as a nursing home, so it has lost its original appearance. 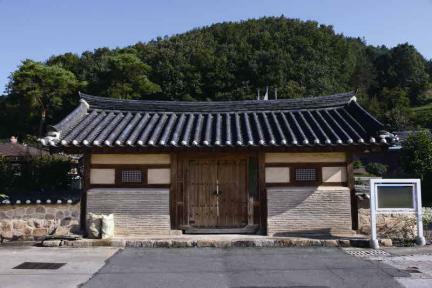 The house used to consist of several buildings, but only the anchae (women’s quarters), sarangchae (men’s quarters), storage building, and shrine remain. Overall, it is sitting in the southeast direction. 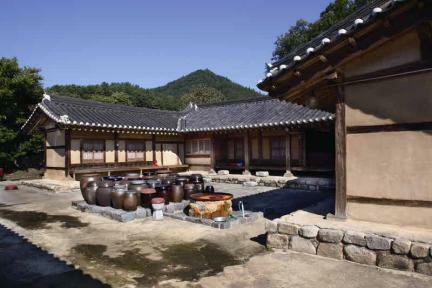 The anchae was built in ㄷ-shaped layout with the “ㅡ”-shaped storage building in front, so it has an open “ㅁ”-shape. The main structure of the anchae is made of 7 kan (unit of measurement referring to the distance between two columns) and 3 kan wing on the east and west sides, respectively. The floor plan is laid out in the Southern Province style. 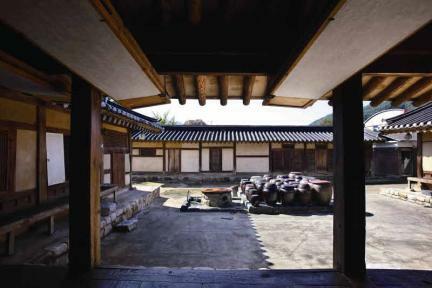 The west side of the main structure has a 2 kan kitchen on its right and left sides, respectively, with the anbang (main room) and a room, the daecheong (main wooden floor), and a smaller bedroom laid out side by side. 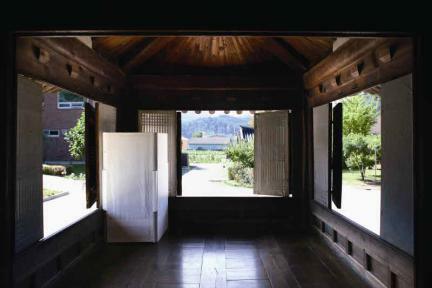 Toenmaru (wood-floored veranda) is installed between the anbang and the smaller room, with another toenmaru installed between the 3 kan in the east wing. This special composition is quite rare and unique to this house. The sarangchae has a 6-kan main structure and a 2-kan wing on the west and east sides, respectively. On the west side of the main structure are a kitchen on the front and a small room at the back. Next to the kitchen are two sarangbang (master’s rooms) separated by a 2-kan daecheong in the middle. A smaller sarangbang is also located at each end of the daecheong. Unlike typical houses that have a 3-kan shrine, this house has a 4-kan shrine with toenmaru (wood-floored veranda) in front. 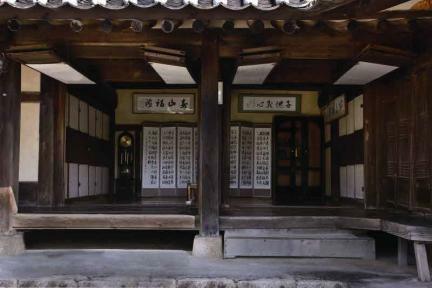 The shrine has daecheong in the middle, so it has a unique layout for a shrine. 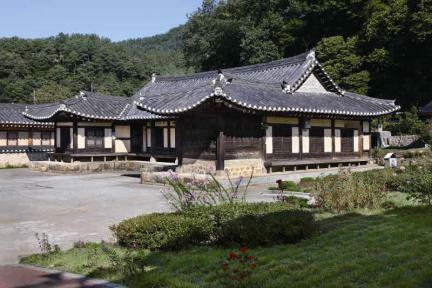 Overall, it is considered to be an excellent example of high-class houses in the late Joseon Dynasty but has been changed greatly due to deterioration and remodeling. Thus, the house lost its original appearance. 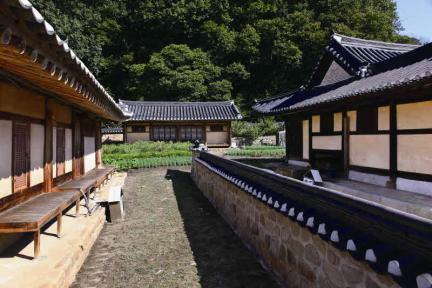 The anchae was built in an earlier period compared to that of the sarangchae, which was built in the late 19th century. The house seems to have been built with excellent architectural techniques. 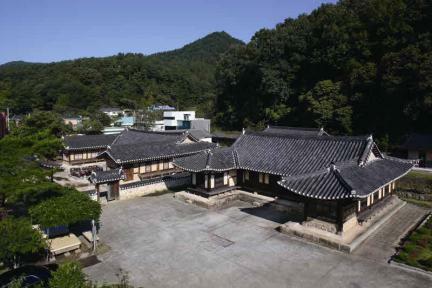 This house was called “Chungbuk Nursing Home” at the time of its designation as cultural heritage but was renamed “Historic House of Cheongcheon-ri, Goesan” by reflecting the name of the region where this house is situated (Jan. 29, 2007). ※ Viewing of the cultural property above is usually available anytime but may be limited depending on the owner’s personal circumstances.